TEANECK, N.J. - January 7, 2018 – Wisenet by Hanwha Techwin America (formerly Samsung Techwin America), a leader in consumer video monitoring and home surveillance products, is unveiling their newest indoor cameras, the Wisenet-SmartCam N1 and N2, today. Featuring the latest in video surveillance technology including facial recognition mobile alerts, seamless two-way communication, and soon to be compatible with the Amazon Echo Show, the new cameras provide consumers with an easy all-in-one home security solution. "Hanwha is continuously striving to provide the highest quality video surveillance solutions to our customers," said Richard Simone, VP of Sales and Marketing at Hanwha Techwin America, "The new additions to our SmartCam family bring immense power in a compact, sleek and stylish design fit for any home setting. 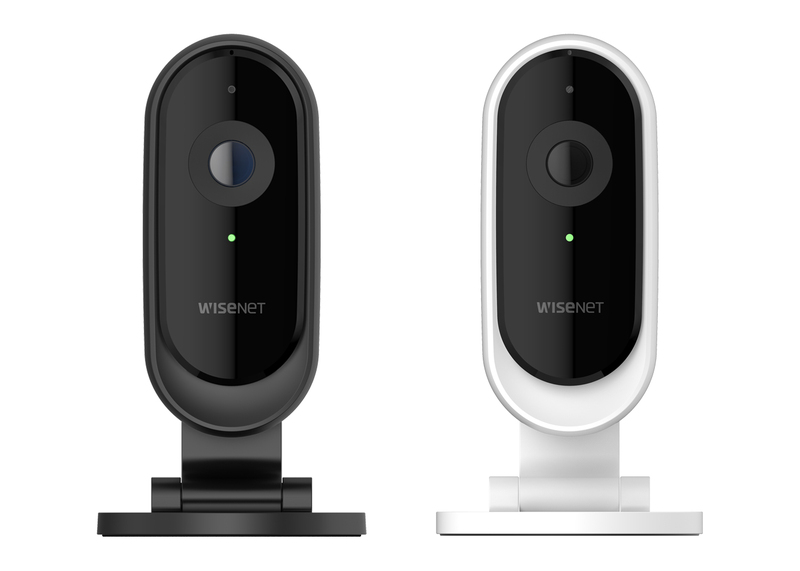 Utilizing our latest Wisenet 5 Chip technology, the N1 and N2 are capable of crystal clear hi-resolution imagery and advanced security features such as facial recognition to give our customers ultimate peace of mind in and out of their homes." The new indoor cameras come in two models, the SmartCam N1 and the SmartCam N2. Both cameras feature 1080p Full HD monitoring, Face Recognition, and Full Duplex Two-Way Talk, but differ in audio detection capabilities. The SmartCam N1 has basic audio detection while the N2 includes Abnormal Sound Detection, alerting users on their mobile phone whenever a sound such as glass breaking, screaming or a baby crying is heard. The Facial Recognition and Human Detection technology featured in the SmartCam N1 and SmartCam N2 is enabled by Hanwha Techwin’s advanced Wisenet 5 chipset. With Human Detection, users receive alerts only when the camera detects people as opposed to animals or cars passing by, reducing false alerts. When Face Recognition is enabled, the camera can detect a person's face and sends an alert of an unidentified face or “interested face” through the Wisenet SmartCam+ app. Users can assign a name to the person's face and add them to their "interested faces" group, so the camera recognizes the face for future alerts. Users with a Hanwha Techwin SmartCloud service plan can also filter through videos based on specific individuals captured by face recognition. For those wondering what their pets are up to all day, you never have to miss a moment. The SmartCam N1 and SmartCam N2 can store recordings using a MicroSD Memory Card (up to 128gb) or through Hanwha Techwin’s SmartCloud cloud-based video storage service. Subscription plans are available for event storage for 30 days, 60 days, and 180 days. The N1 and N2 also feature Full Duplex Two-Way Talk, which allows users to communicate simultaneously through the app and the camera. Parents out of town and looking to check in with the babysitter can see, listen and speak to them with ease, and the babysitter can communicate back and forth directly with them. Users will soon be able to enjoy a truly connected smart home experience with a firmware update that integrates Amazon Alexa allowing the N1 and N2 to work with the Echo Show. Users will be able to view the cameras live feed on their Echo Show with a simple Alexa command. The SmartCam N1 and SmartCam N2 will be priced at $149.99 for the N1 and $199.99 for the N2. For more information on the SmartCam N1, N2 and other Wisenet video surveillance products, please visit www.wisenetlife.com. The SmartCam N1 and N2 will be on display at the International CES Sands Expo, Level 2, Halls A-D, Booth #42546. Hanwha Techwin has made major upgrades to its Wisenet SmartCam+ app, in addition to adding the SmartCam D1 to it. Users can quickly navigate through the new app with its easy-to-use features, updated home screen, and simple product setup. The app is available for download on iOS and Android devices through the Apple App Store or Google Play Store. To advance video surveillance solutions worldwide, the Hanwha Group acquired Samsung Techwin America from Samsung in December 2014. Building on the company’s history of innovation, Hanwha Techwin America is dedicated to providing security solutions with the highest levels of performance, reliability and cost-efficiency under its new brand Wisenet. For more information, visit www.wisenetlife.com.